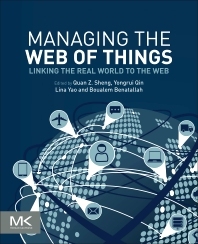 Managing the Web of Things: Linking the Real World to the Web presents a consolidated and holistic coverage of engineering, management, and analytics of the Internet of Things. The web has gone through many transformations, from traditional linking and sharing of computers and documents (i.e., Web of Data), to the current connection of people (i.e., Web of People), and to the emerging connection of billions of physical objects (i.e., Web of Things). With increasing numbers of electronic devices and systems providing different services to people, Web of Things applications present numerous challenges to research institutions, companies, governments, international organizations, and others. This book compiles the newest developments and advances in the area of the Web of Things, ranging from modeling, searching, and data analytics, to software building, applications, and social impact. Its coverage will enable effective exploration, understanding, assessment, comparison, and the selection of WoT models, languages, techniques, platforms, and tools. Readers will gain an up-to-date understanding of the Web of Things systems that accelerates their research. Yongrui Qin is currently a Lecturer at School of Computing and Engineering, University of Huddersfield, United Kingdom. His main research interests include the Internet of Things, Graph Data Management, Data Stream Processing, Data Mining, Information Retrieval, Semantic Web, Computer Networks, and Mobile Computing. Dr. Qin has published more than 40 refereed technical papers, including publications in prestigious journals, such as IEEE Trans. on Parallel Distributed Systems, World Wide Web Journal, Journal of Network and Computer Applications, and IEEE Internet Computing, as well as top international conferences, such as SIGIR, EDBT, CIKM, WISE, DASFAA, and SSDBM. Lina Yao is currently a Lecturer at School of Computer Science and Engineering, the University of New South Wales. Her research interest lies in Data Mining, Internet of Things Analytics, Ubiquitous Computing, and Service Computing. Her work has published in a wide range of prestigious journals such as ACM Trans. on Intelligent Systems and Technology (TIST), ACM Trans. on Internet Technology (TOIT), IEEE Transactions on Parallel and Distributed Systems (TPDS), IEEE Trans. on Knowledge Discovery and Engineering (TKDE), IEEE Internet Computing, ACM Trans. on Knowledge Discovery (TKDD) and IEEE Trans. on Services Computing (TSC), as well as top international conferences such as SIGIR, ICDM, UbiComp, CIKM and ICSOC. She is the recipient of Australian Research Council Discovery Early Career Researcher Award (2015) and is recognized as Inaugural Vice Chancellor's Women's Research Excellence Award (2015). Boualem Benatallah is currently a Scientia Professor at the School of Computer Science and Engineering, the University of New South Wales. Prof. Benatallah’s research focuses on Web service protocol analysis and management, enterprise services integration, large scale data sharing, cloud computing, and the Internet of Things (IoT). He is the leader of the Service Oriented Computing research group and has more than 220 research papers in leading international journals and conference proceedings. Prof. Benatallah’s research has been heavily cited by his international peers. He has more than 14,000 citations with an H-index of 52, according to Google Scholar. This book presents very good content and knowledge about the INTERNET of things.